Three conifers are native to Britain: the Scots pine, the juniper and the yew. There are between eight and 10 species of yew worldwide (scientists are still debating about their classification). Ours is the European yew, Taxus baccata, but it’s not exclusive to the UK, extending eastwards as far as Turkey and Northern Iran. Preferring dry, shallow soils, the yew flourishes on chalky downlands and coastal cliffs. However, it can tolerate a wide range of temperatures, soils and climates. When they are mature, yew trees can assume chunky shapes that are conical, triangular or cylindrical – but they can also be relatively shapeless, flattening out with a wide spread. They can grow as tall as 80 feet, but if they are close to a building they are sometimes lopped before they reach that height. The evergreen leaves are long and narrow, up to an inch and a half in length. Dark green, with a waxy texture, they grow in a spiral arrangement around the stem. The bark is brown and scaly, quite thin, and the trunk can become deeply furrowed with age. The yew is dioecious, meaning that it has both male and female forms. Cones on the male trees shed pollen in early spring. From early September, the female tree bears bright red cup-like berries or ‘arils’, each containing a single seed. These are eaten by birds such as thrushes and waxwings, which distribute the seeds via their droppings. 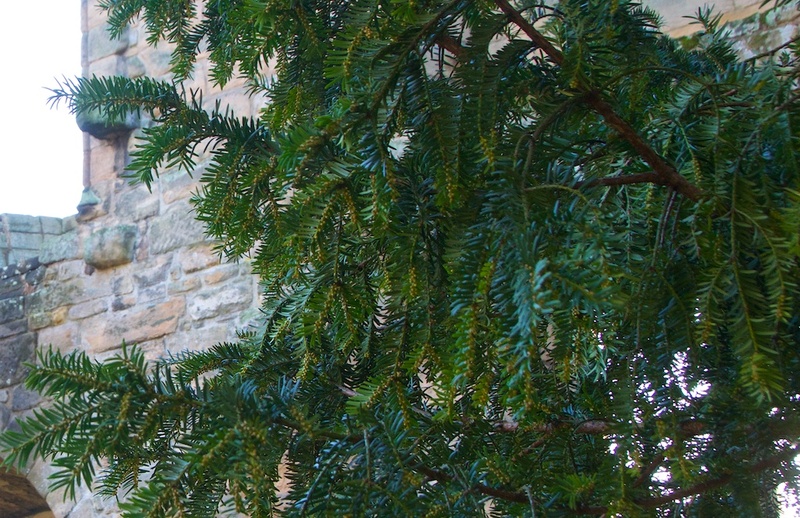 Don’t ever eat the leaves of a yew tree – they are poisonous, particularly when dried. Even the sawdust is toxic! The aril is the only part that isn’t harmful, although the seed inside it certainly is. However, it can pass through a bird’s digestive system intact, without causing any harm. 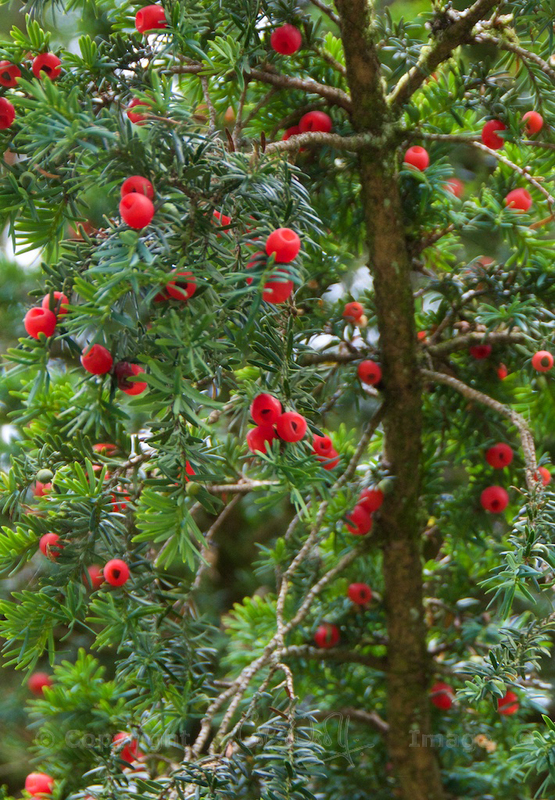 The yew’s toxicity comes from a natural alkaloid called taxane. This is a constituent of the chemotherapy drug Taxol, and in fact clippings of yew are still taken for this purpose. Because it’s so resistant to repeated pruning, the yew is traditionally popular for hedges and topiary. As a softwood timber it’s harder and heavier than most hardwoods, polishing to beautiful shades of golden brown and orange through to rich red. 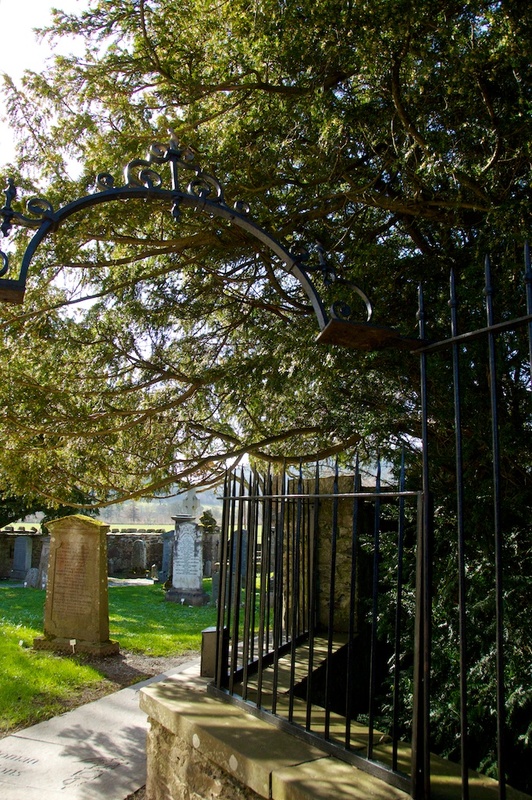 No graveyard seems complete without at least one old yew tree, either growing by the lych gate or overshadowing the church door. What we tend to forget is that many of these trees may well have been there before the church was built, perhaps marking a sacred shrine or well. It has been shown that some churchyard yew trees are planted on blind springs – at Painswick in Gloucestershire, 99 yews in a churchyard were discovered to be sited on nodes or springs; and some churches may once have been encircled by yews. 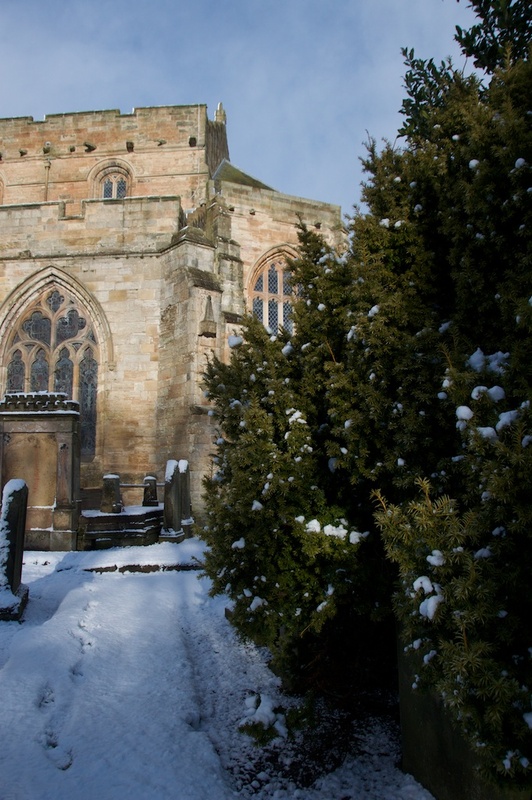 Why should yew trees be planted around a sacred site, whether it’s a church or a shrine? There are many possible answers to this question. Even if it appears to be dying, a yew tree that is thousands of years old is still capable of creating fresh life, because new trees will take root where its branches touch the ground. Not surprisingly, it has become the symbol of re-birth, a life after death. And there are specific links with Christianity: some stories say that the cross of the crucifixion was made of yew, and it has been linked with the Tree of Life in the garden of Eden. On Easter Sunday, the altar would be decked with its branches, and fronds of yew were carried on Palm Sunday. More prosaically, yews may have been planted in graveyards to discourage farmers from grazing their livestock in there! 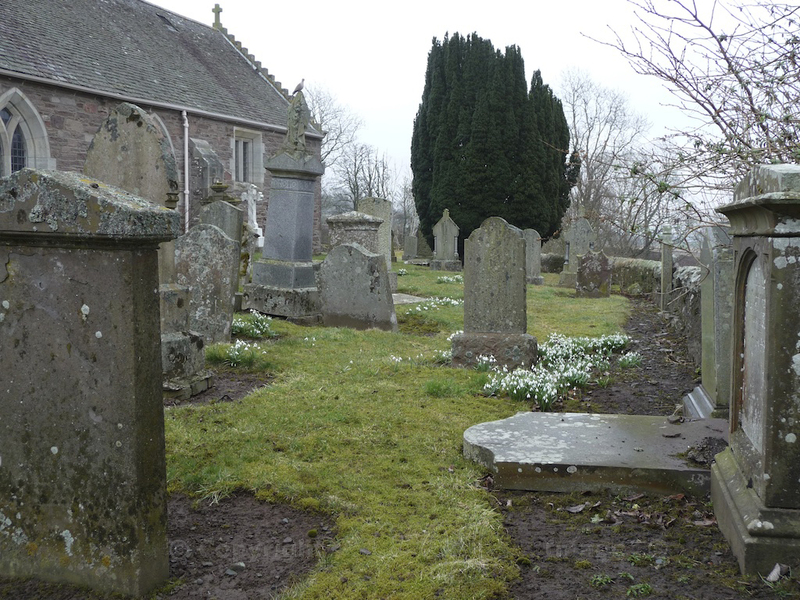 Sometimes, the yew trees in a churchyard were planted according to the route taken by a funeral procession. 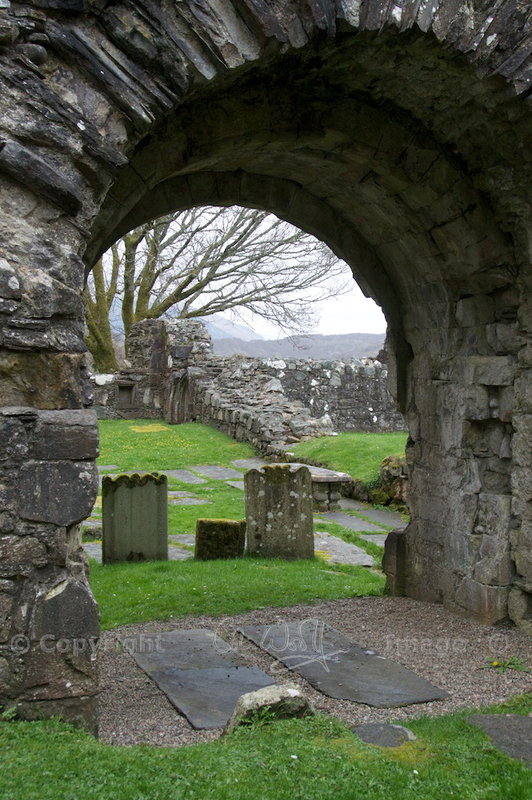 There would be one beside the path leading from the gateway to the main door of the church; another would guard the path to the second or lesser doorway. The priest and his clergymen would stand under the first yew to greet the coffin-bearers. But the yew has a longer memory than man, and this is just the beginning. Revered by the Druids, it was one of nine sacred trees used for kindling Beltane fires. In Irish mythology the yew was known as the Tree of Ross, ‘the offspring of the tree that is in Paradise’, and legendary battles were fought over its ownership. Likewise, the Greeks associated the yew tree with the goddess Hecate, multi-faced guardian of the underworld. Shrines to her were placed by doorways, offering protection to those within. This may be the real truth behind all those overgrown yew trees standing sentinel by the church door. Bowls, tankards, barrel hoops, tool handles, combs, relic boxes, dowsing rods… the wood of the yew tree has been shaped into a wealth of different items, at least some of them ceremonial. Yew staffs were carried by royalty and judges, and the Druids believed that wands of yew would banish evil spirits, bringing purity and peace. However, some of the implements made from yew didn’t bring much peace at all. Whole plantations of yew were once cultivated for the manufacture of longbows, a formidable weapon carried by English and Welsh archers during the Hundred Years War in the 14th and 15th centuries. The woodlands were carefully tended to ensure that the trees grew with a straight grain and were free from knots. 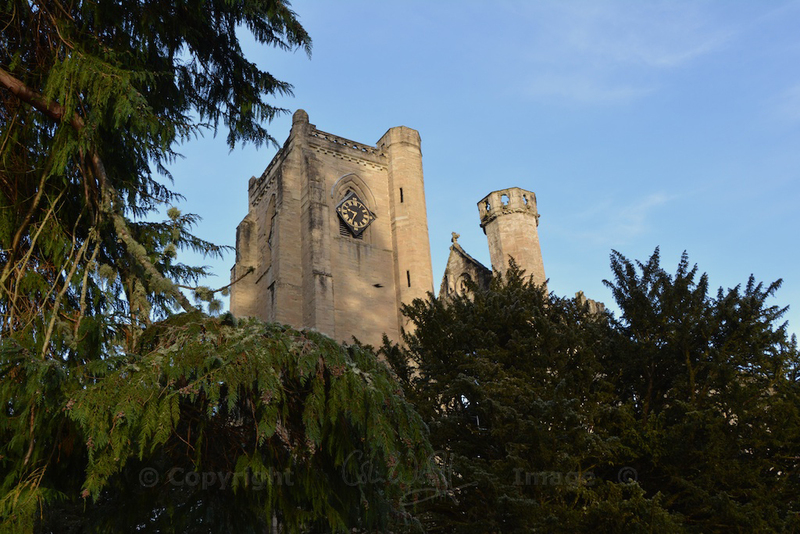 According to historical sources, Robert the Bruce ordered wood from the sacred yews of Ardchattan Priory to be made into longbows that were used at the Battle of Bannockburn in 1314. The tradition of making longbows from yew persisted at least until Tudor times. When the Mary Rose, the famous warship of Henry VIII, was lifted from the bed of the Solent in 1971, several yew bows were recovered from the wreck. Measuring six and a half feet long, they would have had a draw length of nearly 30 inches and a draw weight of up to 185 lb (84 kg), which would be a serious challenge for most modern archers. And the oldest… In 1911 a spear made from yew was discovered at Clacton-on-Sea in Essex. At 450,000 years old, this is by far the oldest wooden implement ever found in the British Isles. The Gaelic word for yews is ‘iubhair’ (which I believe is pronounced ‘YOO-ar’) and it occurs in some Scottish place names. Abhainn Coire an Iubhair, ‘river of the yew tree corrie’, and Sgorr an Iubhair, ‘rocky peak of the yew’, can be found above Loch Linnhe; and Loch Iubhair, ‘loch of the yew trees’ is a lovely tranquil loch near Crianlarich. A sacred yew once stood by Tobar na h-iu, a healing well in Easter Ross. It’s believed there could be a link here with Iona, St Columba’s sacred isle, the name of which may come from the same Gaelic root. 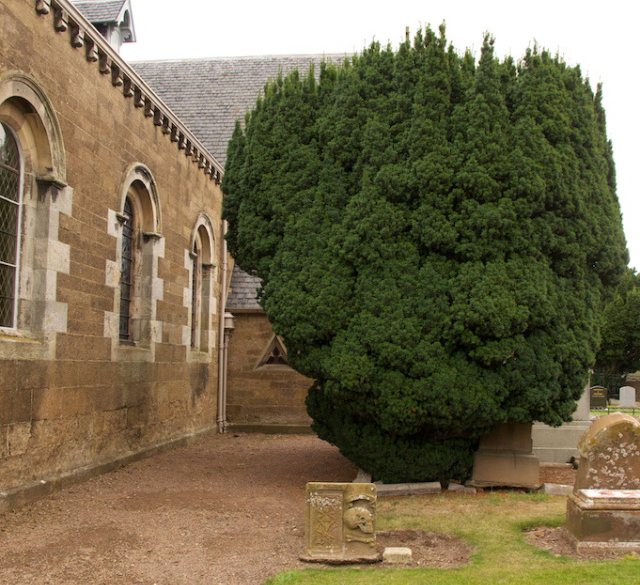 The Fortingall Yew in Fortingall Churchyard, Perthshire. I have visited this beautiful old tree myself, and you can read about it here on The Hazel Tree. Believed to be at least 5,000 years old, it’s linked in folklore with Pontius Pilate; at one time, funeral processions were carried through the natural arch made by its hollow trunk. 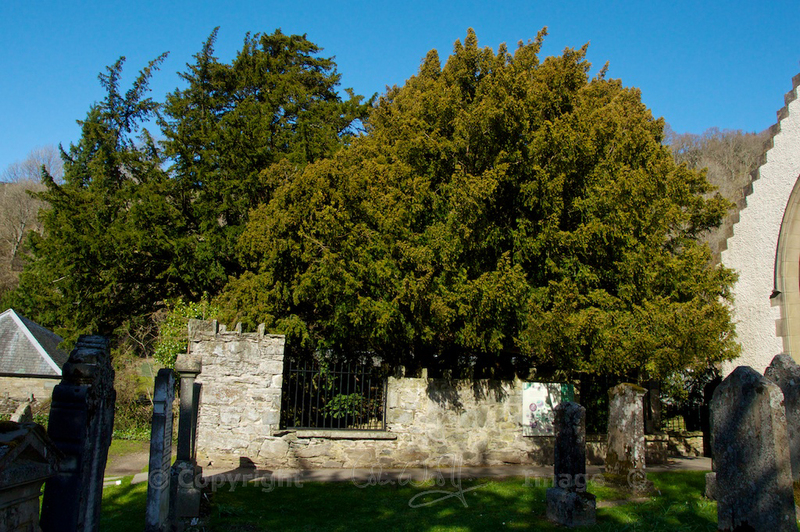 The Bleeding Yew of Nevern: In the graveyard of the 6th century St Brynach’s church at Nevern in Pembrokeshire stands ‘the bleeding yew’, which oozes blood-red sap from a wound on its trunk. 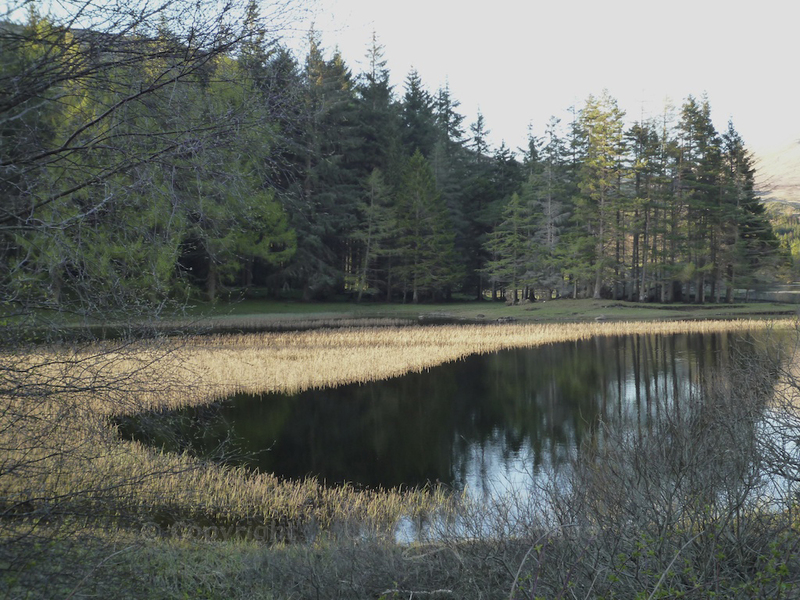 A number of myths have grown up to explain it, among them the story of a monk hanged for a crime he didn’t commit; and there’s a prophecy that says the tree won’t stop bleeding until a Welsh Prince is crowned at Nevern. The Llangernyw Yew: At St Digain’s Church in Llangernyw, North Wales, is a yew tree believed to be between 4,000 and 5,000 years old; the hollow trunk has a girth of over 35 feet. According to local tradition, the church is inhabited by an ancient spirit known as the Angelystor or ‘Recording Angel’. Every year at Hallowe’en, a mysterious booming voice is said to intone the names of parishioners who will die the following year. Folklore tells of a local man, Siôn Ap Rhobert, who heard his own name and challenged the spirit, but he still died within 12 months. Certainly, the site was sacred long before Christianity: two standing stones in the graveyard may at one time have formed an ancient altar. 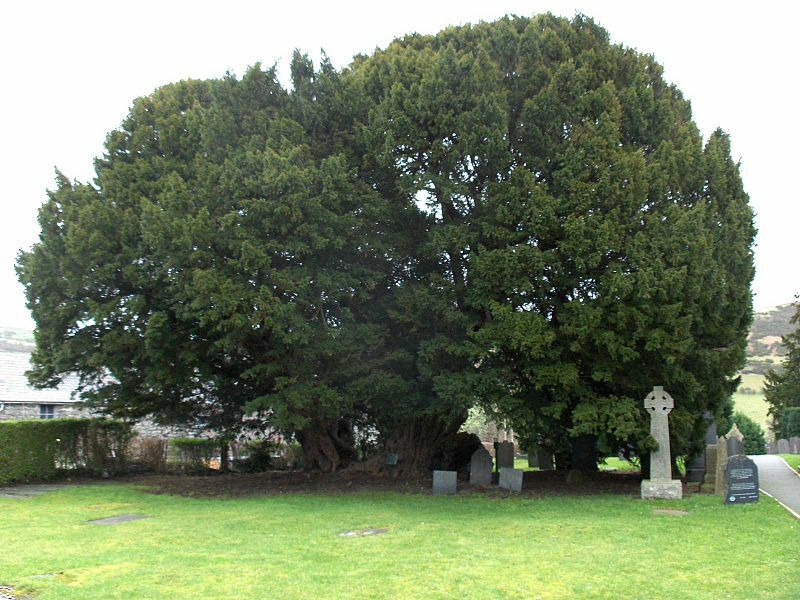 For a more comprehensive list of ancient yew trees, take a look at The Ancient Yew Group. It’s quite appropriate that the wisdom and lore of the yew tree just keeps appearing and multiplying – however much you read, you never seem to reach the end. It’s like pulling on a very, very long root. I’ve tended to overlook yew trees, because when I’m in a churchyard I’m usually concentrating on the ancient buildings or gravestones. I’ll be paying them more attention from now on! Footnote, 27th November 2014: When I first published this article, I included a photo of some trees by Loch Spelve on the Isle of Mull, which I had assumed were yews. I have now had it confirmed by the Ancient Yew Group that they are, in fact, Monterey cypress. This is the photo in question! My thanks to Norma Dowling for first drawing my attention to this. Here are some more of the features in this series. To see them all, go to ‘Features by category’ in the right hand-margin of the home page, and click on ‘British Trees’. I learned a lot myself, Viv! It’s a good job we don’t eat the sawdust, you’re right! Glad you enjoyed it. Very interesting! I used to live with some yews that were kept carefully pruned. I had no idea they had such a rich history. I will have to do some more reading on this. And I do appreciate your links. Really glad to know you enjoyed it! Thank you. Yes, I was fascinated to read about them. There is something otherworldly and magical about ancient yews. Wonderful post, Jo! Wonderful trees, the yews. We have the Pacific yew in The States. They are rare here, sadly due to poaching for their valuable bark. I know of a few locations in the wild, and visit these wonderful trees from time to time. Thank you, Julie! 🙂 That’s a shame that the Pacific yew is scarce. It seems that Britain is the last bastion of the European variety, at least the very ancient ones. I would like to go and seek out some more of these old trees, now that I’ve read about them. Thank you for this wonderful post. I have been longing to make a return visit to the Fortingall Yew. When I do, I will reread this, because there’s a lot here I didn’t know about yews! Do you suppose the name ‘yew’ comes directly from ‘iubhar’ (which is pronounced as you say)? Whoa!!!! !….Can we truly truly please realize HOW POWERFUL AND PROFOUND that statement is given by Jo Woolf ? AS YOU SAY……. ( and what i feel compelled to add) …. ” IS “. Love to ALL ……A cautionary nudge to be careful about what thoughts you think…! I thank the wisdom of the Yew tree to bringing this knowledge forth and with Christs Love. Thanks, Fern, for your kind words! I enjoy your ‘Magazine’. I live on Mull, have similar interests and we have a cat! I was delighted to see a photo of one of my favourite Mull trees! However I don’t think this is a yew. It does not have needles and it does have little cones instead of arils. 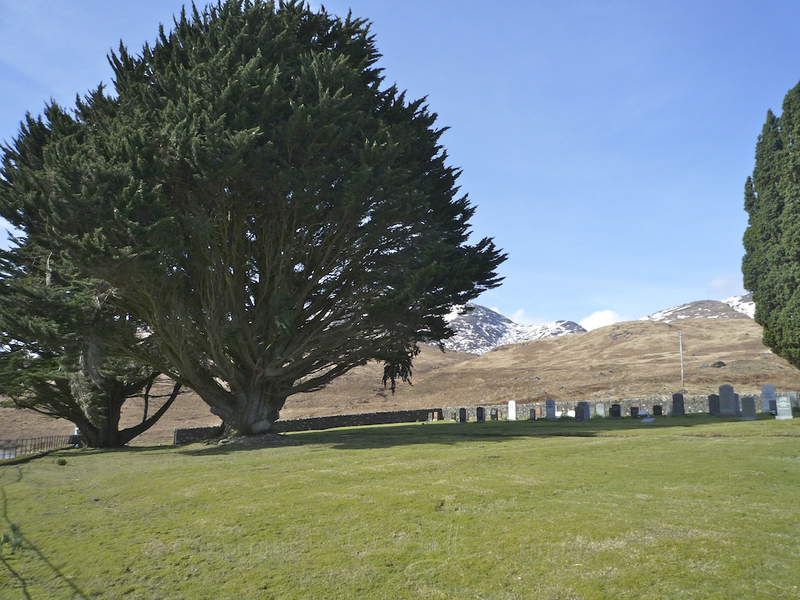 I think it is a Monterey Cypress; one of the trees that grow better on Mull than in California! I am on holiday in south of England but on Mull I have a twig and cones from this tree that I could photograph for you. Hi Norma, and thank you for getting back to me! Thank you also for your efforts to find out what trees they are. Tim Hills at the Ancient Yew Group has confirmed that they are Monterey Cypress. Next time we are on Mull we will go and have another look and take some better photos! Thank you for your offer and suggestions regarding the other trees, which sound magnificent. I will keep my eyes open for those too. That’s if I’m not looking for rocks!! 🙂 Glad to hear that you love them too! What a great profile of the Yew in the UK! Excellent article, Jo! Thank you very much! I enjoyed researching this one. The folklore of trees never ceases to intrigue me. I didn’t notice references to the Yews in the church yard at Ulcombe in Kent (you’ll need to read to the bottom of the page) http://en.wikipedia.org/wiki/All_Saints_Church,_Ulcombe or to the Kingley Vale National Trust in West Sussex –some references say it it is the largest yew forest in Europe. http://en.wikipedia.org/wiki/Kingley_Vale_National_Nature_Reserve So I thought I’d add these references. Hope they are of interest. You’re so welcome. I love what you are doing here..Kingley Vale is a truly mystical experience…timeless and magical. Thank you! 🙂 I love woodlands and that one sounds very special.